Increasing success rates for Aboriginal students is one of Canada’s most pressing educational challenges. As the acquisition of literacy skills is fundamental to student achievement, it is important to build our knowledge base about what works in K-12 literacy and language instruction in Aboriginal settings. A recent study of ten schools offers some insight into promising practices. The schools – selected because they were creating significant measurable progress for their Aboriginal students – were located in British Columbia, Yukon, Alberta, Saskatchewan, and Manitoba. They were as diverse as their geographical locations, ranging from inner city to isolated rural reserves. Collectively they enrolled 3,258 students, with individual enrolments varying from 74 to 915 students. The set included two secondary schools, four elementary, one pre-Kindergarten to Grade 9, and three schools serving the full PK-12 spectrum. Three schools were under the authority of school districts, one under the Department of Education, and the remaining six were band-operated. The research was conducted under principal investigator, Dr. David Bell and his team during the 2003-04 school year. The full report, Sharing our Success1, contains richly detailed case studies. Some of the key findings related to literacy and language instruction are described below. Although literacy instruction varied widely across the set of schools, it was evident that all sites were investing in literacy resources and had deliberately chosen appropriate strategies to meet local needs. In six of the ten schools, the improvement of literacy skills was an explicitly stated goal, referenced within the school’s annual improvement plan. In the case of these BC, Alberta, and Yukon schools, such commitments were aligned with literacy criterion and growth targets articulated and supported by the school district and/or the province/territory. Progress in achieving these reading and writing targets was measured and reported by corresponding external assessments in terms of numbers of students meeting, not meeting or exceeding expectations. This brief provides an overview of the literacy programs in the 10 schools,including instructional methods and resources, interventions employed, the classroom environment, teacher characteristics, use of assessment and the extent of instruction in Native languages. The discussion which follows raises significant questions which point to the need for further research. As seen in Figure 1, no two literacy programs were identical, although some schools shared common elements. Commercial reading programs such as SRA, Nelson Benchmarks, Mastery Reading, Corrective Reading, Star Reading, Accelerated Reading, Reading Recovery, Reading 2000, SRA and Scholastic were commonly employed. Five schools had instituted highly structured reading programs, believing that their students benefited from direct instruction or precision teaching and predictable lesson patterns and routines. Several schools emphasized vocabulary building to overcome English language deficits that interfered with comprehension and reading in the content areas. One tailored instructional strategies to cater to students’ perceived visual learning style. Some assigned literacy instruction such prominence that other areas of the curriculum were compressed or integrated into the reading and writing programs. Alert Bay possessed an exceptionally rich library. Four schools employed ability groupings and levelled reading materials. This method of grouping for instruction entailed common language arts timetabling for primary classes or even school-wide. In some of these sites, teaching assistants, student teachers and other resource personnel were also utilized to create very low pupil/teacher ratios for more targeted instruction. Other schools relied on conventional grade groupings, with teachers seeking to meet the diverse needs and abilities within the classroom. Four schools made use of computerized reading programs to allow individualized guided instruction. A factor common to all schools in the study was the small size of instructional groups compared to most provincial schools. Calculated from the numbers of teaching staff and student enrolments provided, teacher/pupil ratios ranged from a low of 1/11 at Chalo to a high of 1/18 at Princess Alexandra, with most schools falling between 1/14 and 1/16. Class size may well be an important factor contributing to educational success by allowing more individual contact time between teachers and students. Teachers of primary classes tended to organize students into two or three groups for instruction in reading and language arts. » The ability to create an accepting and supportive learning environment that is relaxed and comfortable while maintaining a focus on educational goals. » A commitment to student success that includes the belief that each student can learn, the flexibility to adapt and experiment to find optimal programs and methods for each. » A willingness to use appropriate assessment tools to monitor student learning and program effectiveness. » An attitude of solving problems rather than assigning blame; the willingness to tutor, coach, cajole, and encourage students towards their best personal achievement. » An understanding of and respect for local culture, incorporating it into the curriculum. » Frequent and effective communication with parents. All schools had established pro-active programs for students at-risk and were able to point to their positive impact. There was common emphasis on early childhood interventions through Nursery, Headstart, Pre-school, and full-day Kindergarten programs. As a result, the schools were able to document increasing numbers of students entering Grade 1 ready to read. 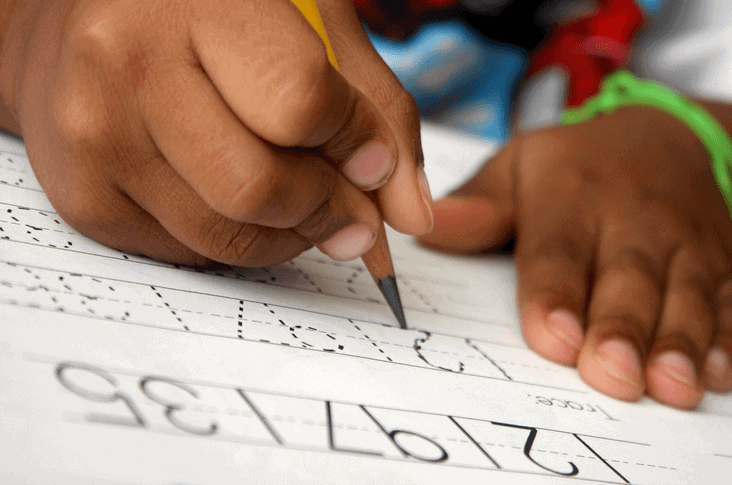 Within the schools, interventions for the primary classes received the most intense focus, directing efforts at developing phonemic awareness, the most fundamental skill to decoding language. Reading Recovery, relying on pullout one-on-one intensive coaching strategies, was used in at least three schools. Other sites deliberately reduced their primary class sizes or deployed additional resource staff to enable small group reading instruction at the appropriate level for each child. Interventions for struggling older readers included tutors, computer assisted programs, access to levelled materials, small group Corrective Reading classes, and alternative programs. It was apparent that the secondary schools were encouraging and equipping students to chose more rigorous English courses which would not limit future educational options. Almost without exception, schools made extraordinary efforts to involve parents in supporting home reading programs, and community workers were often deployed to assist families with few academic traditions in this task. Chalo School made reading a community affair and taught the community to value and support its literacy goals. They used a variety of measures to develop an accurate picture of each student’s learning, to establish base levels, to verify progress and the effectiveness of instructional methods and program material. All schools utilized ongoing informal classroom assessment and diagnostic and screening tools for students at risk. Formal large-scale assessments required by some provinces were utilized for gauging comparative progress against provincial/districts norms at mandated grade levels in the majority of schools. A smaller number of schools employed additional standardized measures such as the Canadian Test of Basic Skills (CTBS) battery for every grade in order to track cohort and individual progress more closely and identify areas of weakness to address. Standardized assessment results over time where available were reported by school in the case studies. A minority of schools eschewed external standardized assessments because of their cultural bias. A number of schools, such as Alert Bay, Chalo, Peguis and Merritt Secondary, fostered students’ metacognition (learning about learning processes), developing students’ understanding and ownership of their own progress on the literacy skills continuum. Students were taught how to assess their own work according to established exemplars and rubrics, for example, and were aware of their progression through the various levels of reading material. The schools in this study provided instruction in seven different Aboriginal languages, in addition to English and, in some cases, French. Cree is taught in six schools, although different dialects are used, and Ojibway instruction is provided in two schools. Additional first languages in the remaining schools include Kwak’wala, Slavey, Southern Tutchone and Nlekepmx (Thompson). The set of schools illustrated the complexity and challenges of delivering quality instruction in Native languages. Although Native language programming was found in all, English was the dominant language of instruction without exception. The extent of first language instruction ranged from one or two periods a week, often in combination with cultural activities, to daily lessons for all grades. For secondary students in three schools, elective local language courses were available, although in many cases these were not recognized for post-secondary admission credits or programs. Reindeer Lake represented the strongest integration of a first language into the broader life of the school. In its commitment to a ‘Cree-friendly environment’, Reindeer Lake intends to extend its K-1 Cree immersion program to the senior grades over time. While immersion programs are under consideration by at least one more school, others have heard their communities express the belief that instruction in first languages is less important than mastery of English literacy skills. Many of the Native language instructors and other staff mentioned the dearth of culturally relevant reading material and supporting resources. Also of serious concern was the declining use of the language in the community, the scarcity of qualified first language teachers and dwindling number of speakers who could serve as role models for students. The study schools reported varying levels of satisfaction with the quality of first language instruction they were able to provide. Almost all noted a shortage of appropriate Native language lesson materials. Most had experienced difficulty in obtaining the services of language instructors who were both fluent speakers and qualified teachers, a problem more prevalent in those whose communities spoke languages in use by less populous Aboriginal groups. In many of the smaller communities, language fluency is retained only by a few elders. Until Aboriginal languages are accepted by all provincial education authorities for high school graduation credits and by universities in fulfilling second language entrance requirements, a continued shortage of Aboriginal students entering teacher training programs fluent in their own language may be anticipated. The priority of language instruction to parents and community members, its relative importance in the curriculum, the amount of time devoted to its teaching and the degree of mastery desired, varied widely from community to community. Each school appeared to have achieved an appropriate balance to enable it to meet community expectations. Within the study, language instruction seemed to have higher importance to the parents of students attending schools on reserves. This could be because off-reserve parents and students tend to share the mind-set of urban Canadians, who view educational programs in terms of their potential to enhance employment opportunities and prefer that their schools emphasize those academic programs required for graduation and admission to post-secondary programs. It was noted that learning problems appeared to emerge when children entered school fluent in neither their own language or English. These learners experienced deprivation in both languages. The local language may have been lost or unused in the home, while the level of English usage did not provide the richness of vocabulary and structure necessary to support reading comprehension. The schools were not compared with each other or with carefully matched control groups. Quantitative evidence through the administration of common assessments could be gathered to determine which approaches produce the greatest gains over time for which children. Educators and researchers need to determine if the gains are replicable on a larger scale and under what preconditions and implementation factors. While research evidence supports the benefits of French immersion programs in Canadian schools, there appears to be little data on the efficacy of Cree or other Aboriginal language immersion programs and their effects on students’ long-term academic success. Does immersion result in greater proficiency in the transfer to English? Do immersion students experience reduced dropout and higher graduation rates in comparison to their non-immersion peers? At what ages is immersion instruction most effective? Which immersion methods and materials produce the greatest gains? Infrastructural issues are also apparent. The research points to the need for communities and homes to provide models of fluent language use, either in a first language or in English to successfully lay a foundation for children’s acquisition of literacy skills. Communities and governments need to develop language initiatives affecting all ages, but especially early childhood, to increase literacy outcomes. To maximize investments in this area, programs must be rigorously evaluated to determine which models offer the highest quality instruction and merit widespread replication. The scarcity of certified and fluent Aboriginal language teachers and of culturally relevant reading material was noted in several case studies and represents a significant threat to literacy outcomes for Aboriginal students in the system at large. To address the need for increased proficiency in teaching Native languages, a national research centre might be established. Such a Centre of Excellence in Aboriginal Language and Literacy could assume lead responsibility for teacher training in this specialty, applied research in schools, and the production of much needed language and curriculum material. Canada’s growing Aboriginal K-12 population and the need to dramatically improve educational outcomes for these students, suggests that these and related literacy issues are well-deserving of rigorous scientific study. Coggins, K., Williams, E. and Radin, N. (1996). The traditional tribal values of Ojibwa parents and the school performance of their children: An exploratory study. Ann Arbor: University of Michigan. ERIC document reproduction service No. ED400116. Feurer, H. (1990). Multilingual education: An experimental project by the Cree Indians of Wakanagish in Quebec, Canada. Paper presented at the International Conference on Thai studies, Yunan, China. (Eric Document Service No. ED337045) House of Commons Standing Committee on Aboriginal Affairs (1990). You took my talk: Aboriginal literacy and empowerment. Fuzessy, C. (1998). Biculturalism in postsecondary Inuit education. The Canadian Journal of Native Education, 22(2), p. 201-212. Hartley, E.A., and Johnson, P. (1995). Toward a community-based transition to an Yup’ik first language (immersion) program with ESL component. Bilingual Research Journal, 22(2- 4), 297-316. Kavanagh, B. (1998). Reaching for Success: Considering the Achievements and Effectiveness of First Nations Schools. A Discussion Paper. Vancouver: First Nations Education Steering Committee. Rothenbusch, T. (Fall 1999). The effects of a precision teaching/direct instruction reading program on the reading achievement of elementary school students. Unpublished thesis. The University of Northern British Columbia. Wright, S.C., and Taylor, D.M., (1995). Identity and the language of the classroom: Investigating the impact of heritage vs. second language instruction on personal and collective self- esteem. Journal of Educational Psychology, 87(2), 241-52. Sharing Our Success: Ten Case Studies in Aboriginal Schooling was commissioned by the Society for the Advancement of Excellence in Education (SAEE) and made possible through research grants from a Canadian foundation, the Canadian Language and Literacy Research Network (CLLRNet), the Aboriginal Branch of the BC Ministry of Education and Northland School Division (Alberta).